The following post was written by my mom, WWW and was originally published a million years ago. Thanks, Mom! Easter means brunch in the garden to me because that is how our family has always celebrated it. For years, we went to my grandparent’s house, owned since the early 1980’s by my late brother-in-law’s family. My mother always made her famous macaroni and cheese to accompany the meat-centric menu of ribs, ham, and turkey. When David was young, he dreamed of his Nana’s mac and cheese, counting down the days to Easter in anticipation (I think he preferred it to the Easter candy!) This is a very rich and high fat dish—not really a recipe for this “Eat Well” blog, but I am including it at the end for the sake of tradition. 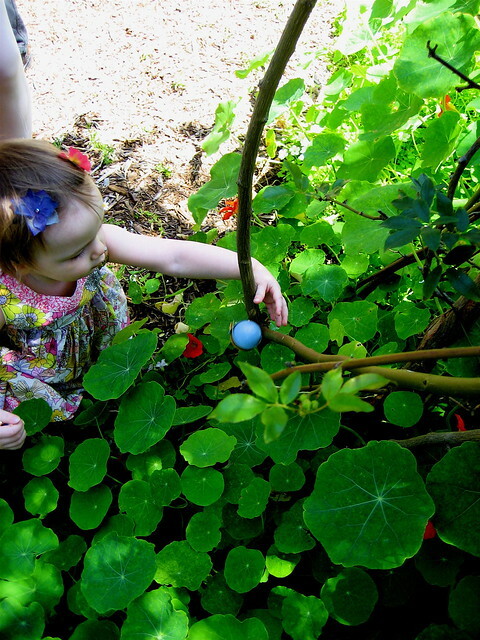 These days we celebrate in my mother’s spectacular garden where the children hunt for dyed eggs nestled between Madeira geraniums and nasturtiums. 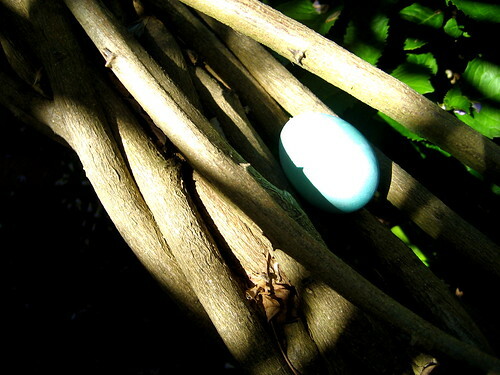 Watching my grandchildren squeal with delight at discovering a brightly colored egg reminds me of the thrill I got 50 years ago, hunting for eggs in this same garden. 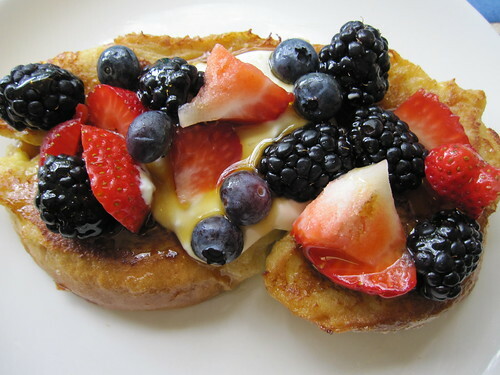 After the hunt, we gather at the long picnic table under the rose covered pergola for our new traditional menu of challah French toast with Vermont maple syrup, fresh berries, freshly squeezed orange juice, and quiche. This is a gluten rich meal, so this year I will be making a crustless quiche for Rachel and me. 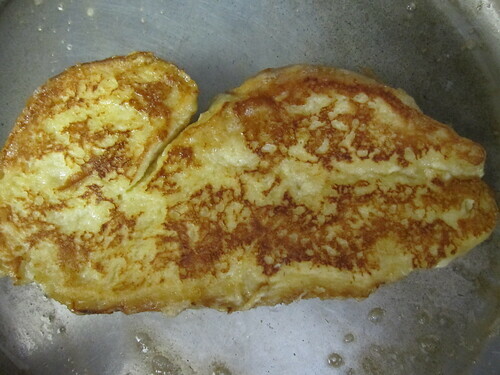 The challah French toast? Not so easy. There are no gluten free breads that can match the light and airy consistency of this delectable bread. Slice challah into thick slices (about ¾-1 inch). Beat eggs well and beat in milk. Add vanilla (unless you are using a vanilla milk substitute). 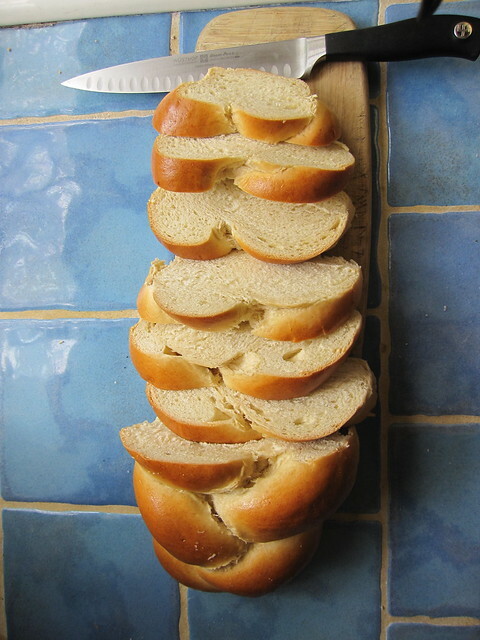 Lay challah slices out in a large shallow dish (or several dishes). Pour milk and egg mixture over the challah, turning the slices over a couple of time to make sure they are evenly placed in the liquid. Let sit for 5 minutes. 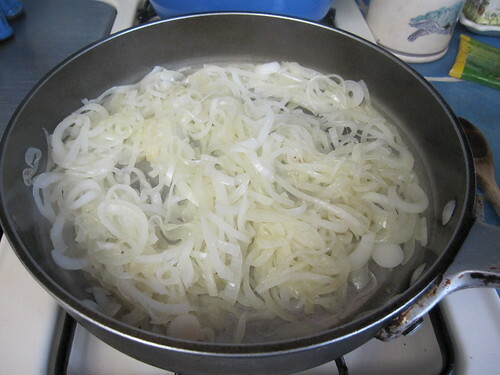 Flip the slices over and let steep in the liquid until it is absorbed (about 10 minutes more). (make sure they are cooked through…they will begin to puff up). Put in a low oven to keep warm (200 degrees) until all French toast is done. Serve with real maple syrup, berries, and yoghurt and or cinnamon if desired (vanilla yoghurt is yummy on this!) Makes about 12 pieces of French toast. topped with fresh fruit, yogurt and syrup. delish! 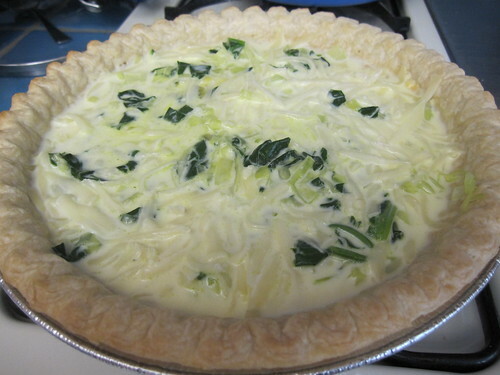 Most quiche recipes call for cream or half and half. I don’t like using either of these as they are too rich for me, but if you use regular milk, the quiche doesn’t set as well. 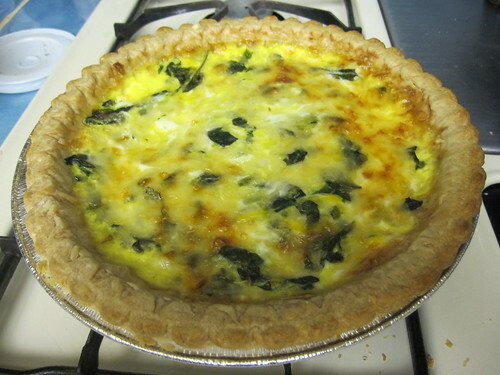 I have discovered that goat milk is a little thicker and when used in a quiche, sets beautifully. You can also use soymilk or other milk substitutes…just make sure they are PLAIN and unsweetened. If homemade piecrust, roll into pie pan, prick all over, and cook in preheated 425 oven until golden brown, about 12 minutes. If using bought piecrust, cook according to directions on package. Beat the eggs and milk together and pour over filling of your choice into cooked and cooled piecrust. Cook quiche at 375 for 40 minutes or until a knife in the center comes out clean. 1. Leak and Spinach (or chard) with cheese (goat, goat cheddar, or feta): Saute sliced leaks in olive oil until tender. Add about a half a pound of spinach and cook until just wilted. 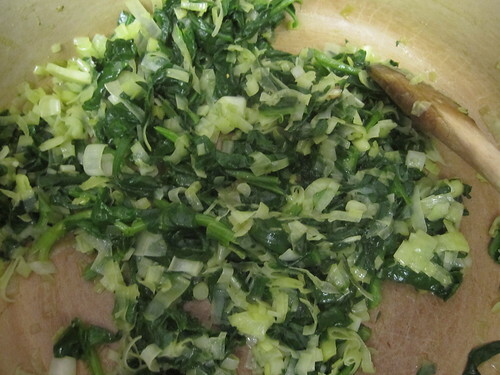 Add leeks and spinach to the bottom of cooked pie shells. Sprinkle cheese on top of vegetables. Pour egg mixture over. 2. 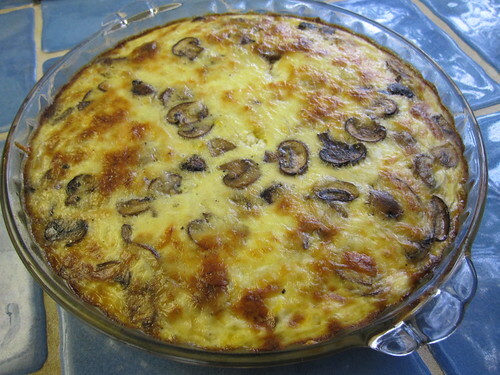 Caramelized onions and mushrooms with Gruyere or cheddar cheese (I use goat cheddar): Slice an onion thinly. Cook in olive oil on medium heat until caramelized, about 10-15 minutes. Note: pictures below = without crust/gluten free. Meanwhile, cook sliced mushrooms (about 12 oz) until brown. Add some fresh herbs if desired (I like thyme with this one). 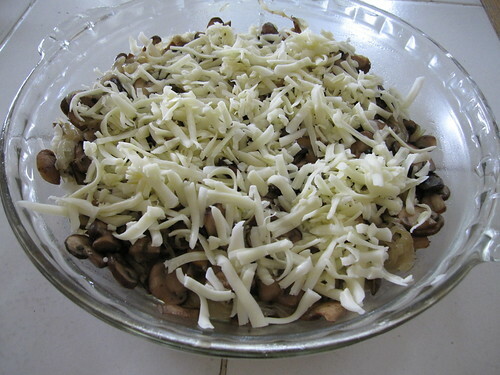 Lay onions and mushrooms in bottom of pie shells. Grate about 6 oz of cheese (more or less if desired) on top. 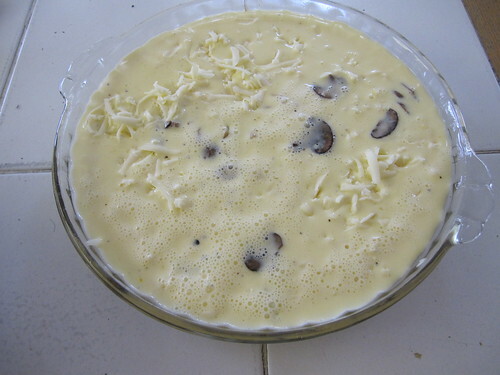 Pour egg mixture over and bake. (This can be made for an army by doubling, tripling, or quadrupling the recipe). Grate cheese, keeping the two cheeses separate. Melt butter and mix in flour to make a roux. 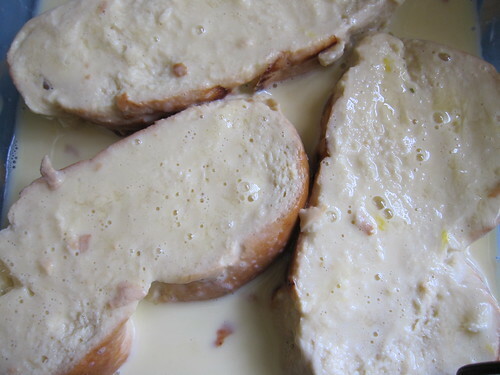 Take off heat and SLOWLY add milk, stirring constantly, so it doesn’t make lumps. Put back on heat and stir on medium high with wooden spoon until it comes to boil. Immediately take off heat and add Tillamook cheese, stirring into the hot sauce. Meanwhile, cook macaroni until al dente (don’t overcook). Wash with cold water to keep from cooking more. 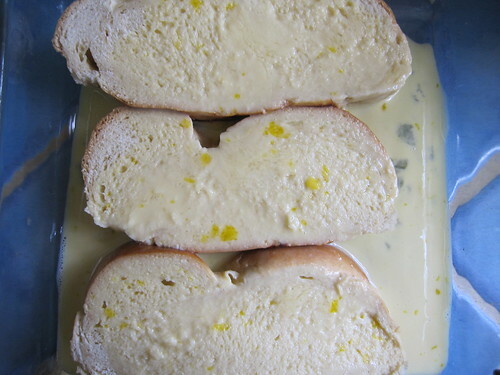 Butter sides and bottom of large baking dish. Add Macaroni to dish and pour sauce over it, stirring well. Sprinkle topping cheese on top. 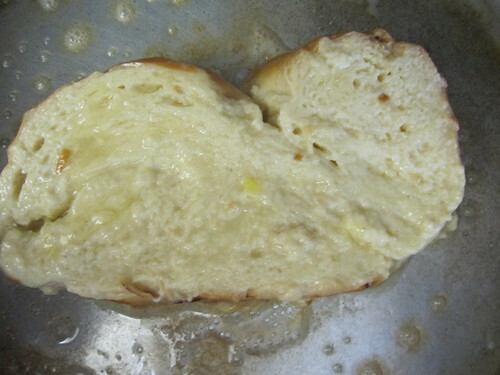 Bake at 425 for about an hour or until it bubbles in the middle and it is brown and crusty on top. Enjoy!